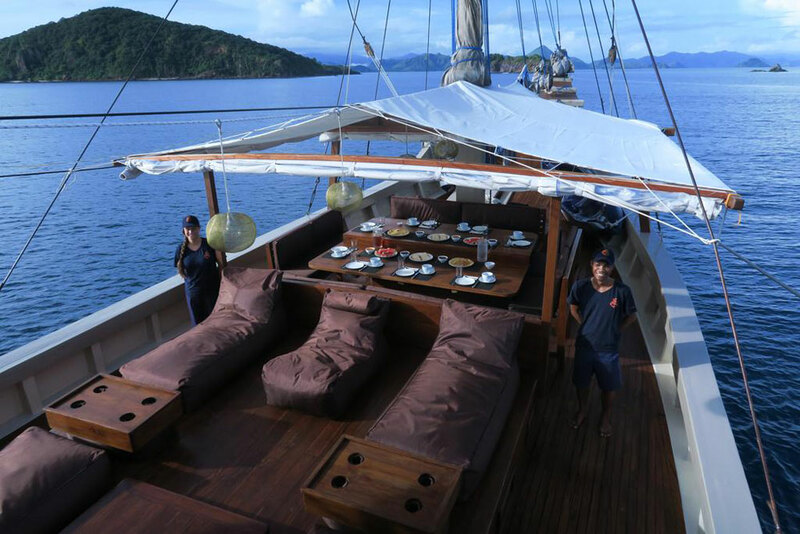 The 32 m Nyaman boat was perfectly designed to offer the services of a 5-star retreat while cruising around Komodo National Park. The Nyaman liveaboard was launched in 2016, after having undergone a refurbishment by a French interior designer. Each of the 7 luxurious cabins offers AC, comfortable double beds, storage space and en-suite bathrooms. Social areas include an indoor lounge and dining area, outdoor dining and sun terrace with comfortable bean bags, perfect for lounging in between dives. Based in Labuan Bajo, the Nyaman boat explores the best dive sites of Komodo National Park. Visit world-class dive area such as Padar, Pink Beach, Manta Point, Gili Lawa Laut and Rinca or Komodo to see Komodo Dragons. Marine life is astounding, with the chance to dive with manta rays and sharks, swim with turtles and dolphins, and hunt for pygmy seahorses and frog fish. Finish the day off with an amazing sunset and discuss all the critters that were found on the dives. The experienced captain and crew of the Nyaman Boat are on hand to help you create a Komodo dive adventure of a lifetime. Exclusive liveaboard accommodation, welcome drink and cold towel upon arrival, all inclusive (breakfast, lunch, afternoon snack, dinner & non-alcoholic beverages), complimentary wireless internet connection, snorkelling activities equipment, complimentary airport transfer – return. Komodo trek, dives price on request -3 spot dives per day, included all equipment and Dive Master, min 2 divers.